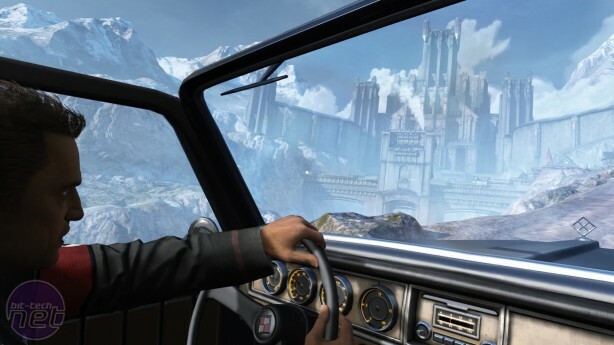 It's difficult not to feel a tad disappointed by Wolfenstein: The Old Blood. After the pulpy delights of the New Order, which saw players infiltrating secret Nazi research bases in an alternate sci-fi universe, stealing nuclear submarines and shooting laser guns on the Moon, a return to the more traditional Wolfenstein themes of draughty castles and occult dabbling was always going to be a difficult sell. But MachineGames surprised us once, perhaps they could do it again. Unfortunately, this isn't the case. While the Old Blood retains the tight, speedy gunplay of the New Order, it largely feels like a retread of familiar ground. Moreover, its problems don't end with a lack of inspiration. The Old Blood is an uneven experience, and fails to address the issues which prevented its bigger brother from being a true great. 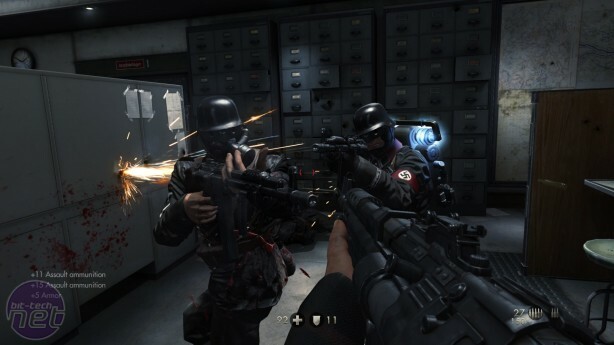 Taking place in 1946, the Old Blood sees the FPS genre's oldest gun-hand B.J. Blazkowicz sneaking into Castle Wolfenstein to steal a document which the allies believe contain the location of Nazi scientist Professor Dethshead's headquarters, and thus the Allies' last hope for victory as Hitler's robot-augmented armies sweep across Europe. Naturally, things don't go to plan, and Blazkowicz finds himself hunted through the castle by its Nazi garrison. The Old Blood is split into two chapters. The first of these, Rudi Jager and the Den of Wolves, focuses on the castle itself, and is undoubtedly the strongest half of the game. It does start terribly, however. The initial half-hour sees Blazkowicz sneaking through the castle's dungeons evading heavily armoured SuperSoldaten, who patrol along powered rails that need to be shut down in order to proceed. 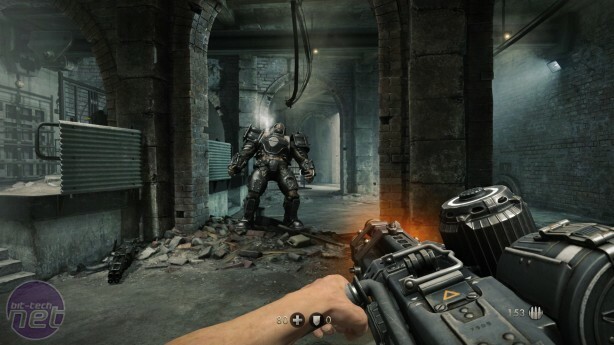 Being spotted by one of these hulking Nazi cyborgs is pretty much game over, and the only weapon Blazkowicz has to hand is a piece of pipe. The pipe is The Old Blood's most original new feature, which doesn't speak particularly well for the game when you think about it. But it isn't as bad as it sounds. The pipe can be wielded as two separate pieces for shanking purposes, or connected together as a bludgeoning instrument. It can also be used to climb certain walls, a nice idea that's almost completely wasted due to the largely linear levels. Like The New Order, The Old Blood allows the player room to flank and manoeuvre during combat, but only once did the game factor the climbing into these arena-esque environments. Fortunately, once you've passed the tedious stealth section, the action picks up almost immediately. Combat-wise, The Old Blood is largely the same as The New Order, which is to say a big dollop of messy fun. 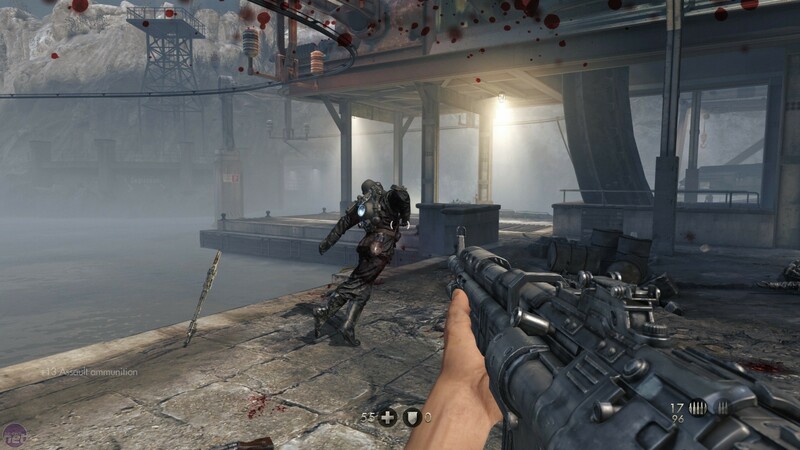 The scenarios aren't as tightly crafted as those seen in the main game - The Old Blood likes to throw large waves of enemies at you and let you deal with the consequences.